Discussion in 'What Breed Or Gender is This?' started by Treegod, Jan 7, 2011. I'm on a roll, and learning lots. Could anyone hazard a guess at this one? An Ancona crossed with something else ... maybe a speckled sussex? Just a wild guess. There are Mille Fleur Leghorns. Her body type is not Speckled Sussex, Where did you get her? I know that Ideal doesn't carry MFLeghorns so can't be from there, but she could be an Ancona. Those are not breeds I keep, so someone else may be better suited to tell you about her. Is she laying yet? 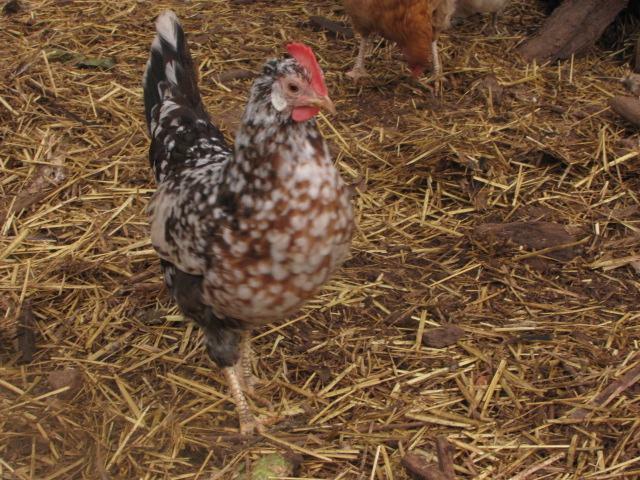 Ancona and speckled Sussex were the suggestions for my black rooster too. And when I looked them up the hens did remind me of her. So possibly we have two Ancona x speckled Sussex from two different places on two separate occasions. I got her from a market here in Spain, and yes she has been laying for quite a while. What's the difference between a mille fleur Leghorn and a dark brown Leghorn with mottled gene? Or are they the same? If you're in Spain, she may very well be a breed we don't even have here in the US! She does look Leghorn in type, but who knows? What color eggs does she lay? What part of Spain are you in, I have family in the South. I think her head and her comb are not fitting to a Leghorn type. But being in Spain, she's likely a mutt or something else. I'm pretty sure part ancona and maybe something flame. Well, duh, didn't catch that the OP is in Spain. No idea, then! Over there, they have many breeds we do not. The eggs are almost white, very faint pink I'd say. Quote:Flame? What's that in the chicken world? Even if I live in Spain I'm still interested in finding out any information I can. I think there are more breeds in common between Spain and the English-speaking world than not.